Not all varieties work in all regions and soil types. At SPG we have the knowledge and experience to help you make the best choices for your farm. Our expanded seed marketing services are your reliable choice for marketing and sourcing seed of all types. What started as a service for our members to separate mixed lots of grain has developed into a very useful way to market your grain. We are able to decontaminate or raise the test weight of your grain for elevator delivery. SPG can clean grain, including products for human consumption such as peas, to any export standard. SPG wholesale feed grains are available in bags, totes or by the truckload. These products are available whole or rolled as well as blended. Our cleaning process guarantees high quality bagged products. Because we are farmer owned and buy directly from producers, our pricing is competitive. Check out our homepage for information on what we're currently buying. 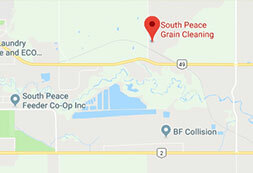 SPG is an approved organic cleaning facility and is capable of accommodating your organic needs, whether it's cleaning your seed, helping you market your grain, or helping you source organic grain.